With the census of life forms in the 19th century naturalists realized that many similar animal species were distributed on different continents or remote islands. For short distances this was explainable by (voluntary or involuntarily) migration on water, on islands or in the air, but many distances were too great to overcome by large animals, especially by mammals. "The anomalies of the Mammal fauna of Madagascar can best be explained by supposing that anterior to the existence of Africa in its present shape, a large continent occupied parts of the Atlantic and Indian Oceans stretching out towards (what is now) America to the west, and to India and its islands on the east; that this continent was broken up into islands, of which some have became amalgamated with the present continent of Africa, and some, possibly, with what is now Asia; and that in Madagascar and the Mascarene Islands we have existing relics of this great continent, for which as the original focus of the "Stirps Lemurum," I should propose the name Lemuria!" 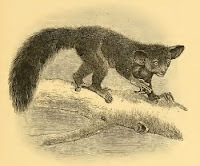 "This fact would seem to show that the ancient "Lemuria", as the hypothetical continent which was originally the home of the Lemurs has been termed, must have extended across the Indian Ocean and the Indian Peninsula to the further side of the Bay of Bengal and over the great islands of the Indian Archipelago." Page 236-237, SCLATER & SCLATER (1899): "The Geography of Mammals." Sclater was not the first to promote ancient land bridges or even a sunken continent in the Indian Ocean, the idea of oceans as drown landmasses was a plausible geological theory at the time. Marine fossils found on land demonstrated that sea level changed over time, land became sea and even if the exact mechanism was unknown, it was not impossible to image that also land would become sea. The French geologist Etienne Geoffrey Saint-Hilaire had speculated about a connection between Madagascar and India in 1840, the English geologist Searles V. Wood (1830-1884) hypothesized the existence of a giant southern continent during the "secondary era" (modern Mesozoic). Alfred R. Wallace (1823-1913), biogeographer of South America and Indonesia, proposed in 1859 a sunken continent to explain the fauna found on Celebes, but became later one of the most eloquent critic of the theory. The theory of Lemuria was interesting speculation but even Sclater mention it only as idea and never promoted it too much. In 1868 the German biologist Ernst Haeckel published his German edition of "Natürliche Schöpfungsgeschichte"(The history of Creation), addressed to a general public where he promoted his view of evolution of life and humans. 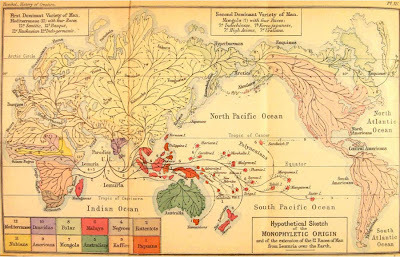 Haeckel considered the earliest humans descending from Asian primates and placed the cradle of humanity in Asia or in alternative Africa and very cautiously on the hypothetical continent between these landmasses. 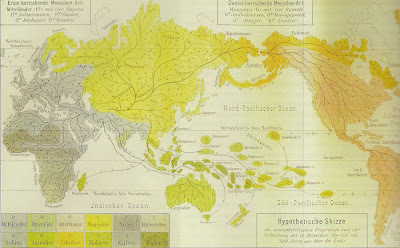 Lemuria played a major role as possible migration route of humans into Africa and Indonesia (Natürliche Schöpfungsgeschichte, page 515). In later editions and the English version of the book, translated by Ray Lankester in 1876, the supposed continent is even emphasised and labelled in the map as "Paradise" and displayed as cradle of humanity. "The primeval home, or the "Centre of Creation", of the Malays must be looked for in the south-eastern part of the Asiatic continent, or possibly in the more extensive continent which existed at the time when further India was directly connected with the Sunda Archipelago and eastern Lemuria." Page 329, HAECKEL (1876): "The history of Creation." Fig.2. and 3. Ernst Haeckel, "A hypothetical sketch of the monophyletic origin and extension of the twelve races of Man from Lemuria over Earth." From Haeckel, Natürliche Schöpfungsgeschichte, Plate XV. 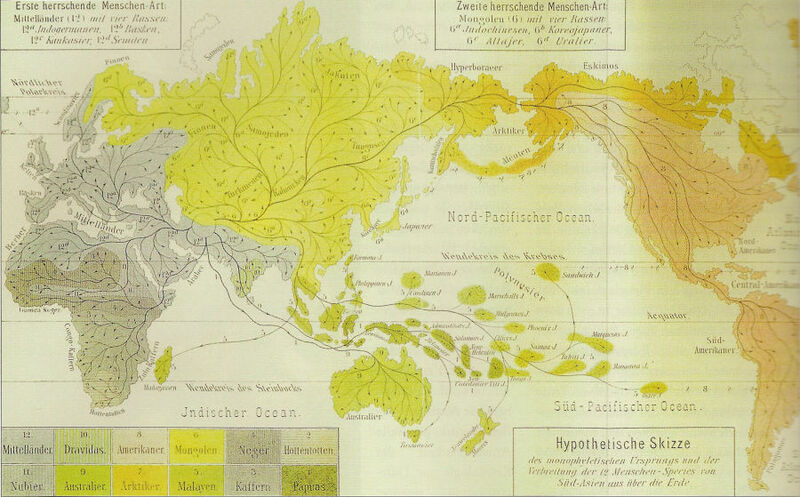 Note the differences in the German version (1868) without Lemuria and the English version (1876) with Lemuria, after 1870 Haeckel adopted and promoted the idea of a sunken continent in the Indian Ocean. "The probable primeval home or "Paradise" is here assumed to be Lemuria, a tropical continent at present lying below the level of the Indian Ocean, the former existence of which in the tertiary period seems very probable from numerous facts in animal and vegetable geography. But it is also very possible that the hypothetical "cradle of the human race" lay further to the east (in Hindostan or Further India), or further to the west (in eastern Africa)." "We do not know yet the region in which the ancestors of the brownish Neolithic peoples worked their way up from the Palaeolithic stage of human development. Probably it was somewhere about south-western Asia, or in some region now submerged beneath the Mediterranean Sea or the Indian Ocean, that, while the Neanderthal men still lived their hard lives in the bleak climate of a glaciated Europe, the ancestors, of the white men developed the rude arts of their Later Palaeolithic period." WELLS (1919): "Outline of History." The idea of Lemura as lost cradle of humankind proposed (however not too actively supported) by serious scientists was to fascinating for pseudoscientific and esoteric groups and authors not to be incorporated in their worldview. 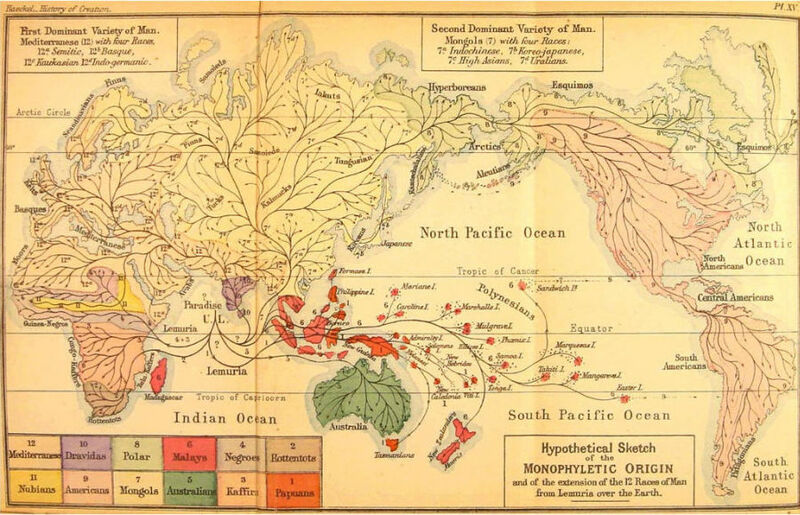 In 1888 the Russian esoteric author Elena Petrovna Blavatskaja (1831-1891), strongly influenced by Asian philosophy, published her "The secret doctrine" in which she proposes Lemuria as the cradle of one of the seven root races of humanity. These beings supposedly possessed four arms and eyes and were egg-laying hermaphrodites and shared the continent Lemuria with dinosaurs. The never existed continent of Lemuria became part of popular culture.